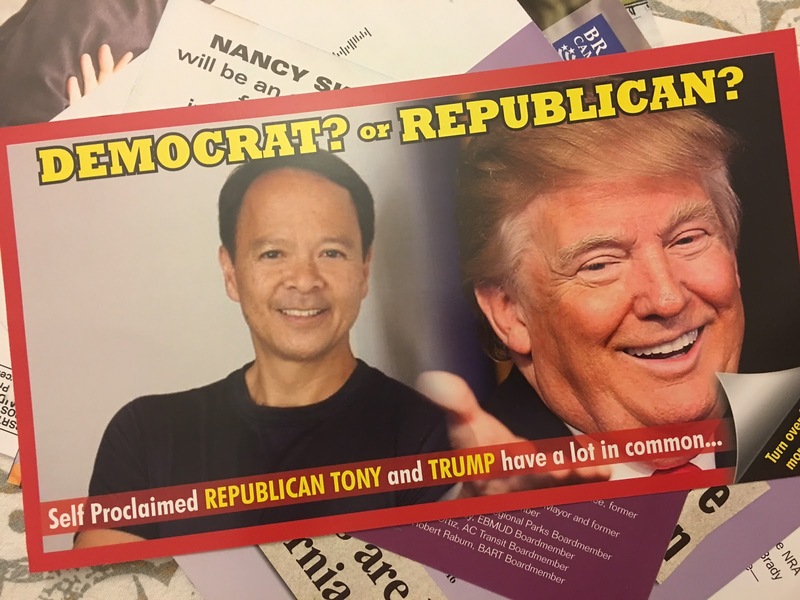 A mailer sent by an unknown group this week aims to link Alameda Councilmember Tony Daysog to Republican presidential nominee Donald Trump, while a robocall Thursday ripped the incumbent councilman for a recent vote involving veterans. The half-sheet mailer, however, contains no clues to the makers of the negative ad. In the mailer there is no clear link made between the two candidates, other than comments Daysog made this summer and reported by the East Bay Citizen in September, in which he openly questioned whether he is still a Democrat. Daysog, along with Councilmember Marilyn Ezzy Ashcraft are up for re-election in Alameda’s at-large council race, along with three other challengers. The top two finishers win. Meanwhile, the onslaught against Daysog continued Thursday with a robocall sent by a group calling itself “Alamedans for Honoring Our Veterans.” As of the second late campaign finance filing period ending Oct. 22, no reports associated to the group exist. If formed between end of October and Election Day on Nov. 8, identifying information on the group and how it is financed would not appear until after the election. Posted in 2016 Election, Alameda, Alameda City Council, Alamedans Honoring Our Veterans, campaign finance reports, Democrats, PTSD, Republicans, robocall, Tony Daysog, veterans. Bookmark the permalink. Wow, be careful what you write as how you identify as your party affiliation, and do not piss of the Veterans Tony! I wonder what secretive group has it in for Daysog? It's certainly not any veterans' groups. It's also not the “Yes on M1” people, they don't have enough money. It's presumably one of the union groups. Most of Alameda's tax revenue goes to unionized labor forces, and Daysog has been a thorn in their side; they probably figure it's worth spending money to pack the city council with people who will be more generous with city funds than Tony is.